When it comes to love, Anna Elliot is stuck in the past. No one can compare to Rick Wentworth, the man she gave up ten years ago at the insistence of her disapproving family. What if she's missed her only chance for real happiness? Since Anna broke his heart, Rick has moved on or so he thinks. Out in Australia, he's worked hard to build a successful career, and a solid wall around his feelings. The words 'forgive and forget' aren't in Rick's vocabulary. So, when they meet again on his book tour of England, it's an opportunity for closure. But memories intrude the pure sensuality of what they once shared, the pain of parting With Anna's image-obsessed family still ready to interfere and Rick poised to return to Australia, can she persuade him to risk his heart again? This contemporary retelling of Jane Austen's last completed novel is the second book in Juliet Archer's Darcy & Friends series, offering fresh insights into the hearts and minds of Austen's irresistible heroes. You've seen my review, now it's your turn to read it! Juliet has offered up a copy of her contemporary Persuasion retelling, Persuade Me, for one lucky winner! 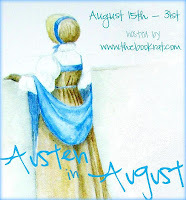 One Austen in August reader will receive a finished copy of Persuade Me. 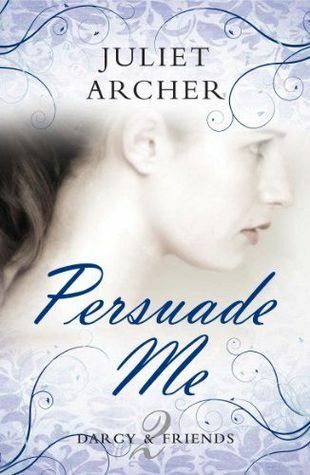 Don't forget to check out what I thought of Persuade Me (hint: I loved it) here!! I love Juliet's Persuade Me - she's done a wonderful job of modernising Persuasion! No need to enter me, I've got paperback and digital versions of this book! Loved Importance of being Emma and look forward to Persuade Me. Thank you for the giveaway! I loved your info above. It really sets the tone. I have only heard wonderful things about this book. I HAVE to read it! Thanks for the giveaway!! I´m not entering - I ´ve read this book and it is THE BEST! I love it. Been pining for this book. I LOVE the cover! Thank you, ladies! I look forward to sending one of you a personally signed copy soon! and HUGE Thanks,Juliet, for the giveaway generosity!! Thank you so much for the giveaway. Persuasion is my favorite Austen novel, and I love reading new versions of it!